Paintouts occur every second Saturday of the month, unless otherwise noted in the newsletter. We meet at a location of scenic beauty often chosen in conjunction with an upcoming show. Whether you are experienced with plein air painting, interested in taking photographs or perhaps drawing for use in the studio later, or just want to share being in natural settings with others, it is worth checking out. This year we have enjoyed gathering at Naples with ocean bluffs, agricultural land and mountains; a private organic farm in the San Ynez Valley near Buellton; Lake Carneros; an historic adobe and farm on the Gaviota coast, Arroyo Hondo Preserve; and a hilltop avocado ranch in the foothills. We like to explore new venues, classic locations, and beautiful sights. Join Us! 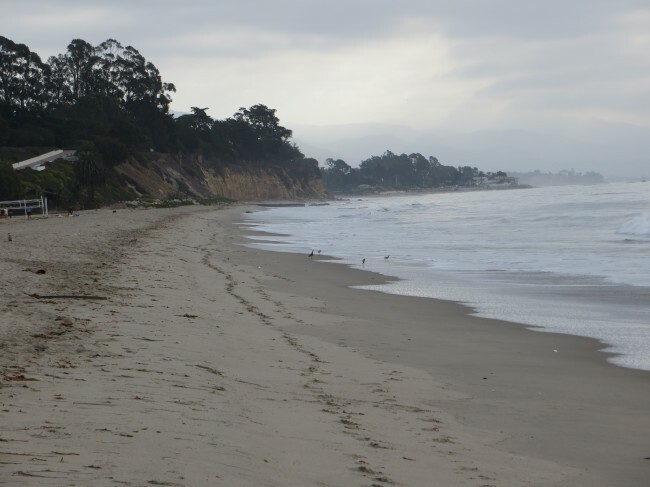 At the north end of Goleta there is a beautiful open space where Calle Real Rd ends and meets Farren Rd. Farren Rd then goes up into the foothills for around 2 miles. 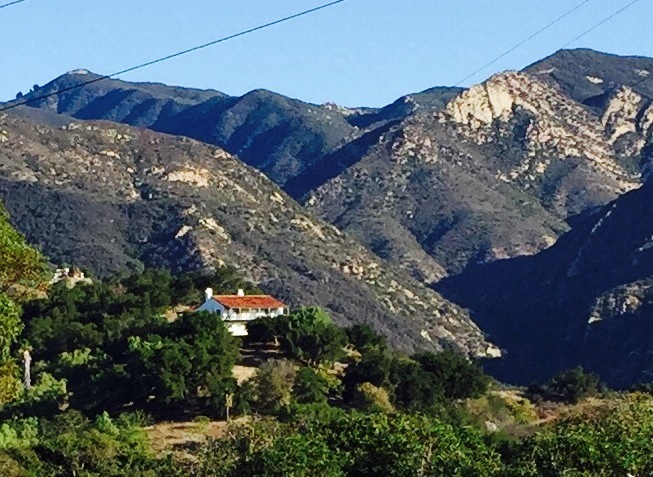 There are wonderful rural, mountain and ocean vistas over the lower Gaviota coast. At the Open Space there are good views to paint from of the rolling hills, fields and mountains in the background. Whether you decide to go further up Farren Rd or paint at the base please be sure to stop and sign in with the waiver. It will be on a silver Honda mini van. Directions: Heading north from Santa Barbara on 101 take the 110 exit marked Hollister Canyon. In .3 miles there is a stop sign at Cathedral Oaks Rd. Continue straight for another .5 miles until Calle Real dead ends with Farren Rd to the right. The sign in seat and center of action will be in the open space on the right. The May Paint Out will be at the Clairmont Lavender Farm in Los Olivos. Meryl Tanz and Sean Everett Crowder have been growing and operating a lavender farm in the Santa Ynez Valley for many years. Although the height of the season is in July, and you are welcome to return, we will be having our May Paint Out there keeping June and July open for sites specific for the July Maritime Museum Show. There are olive trees dating back 175 years, majestic oaks, out buildings and there will most likely be some budding lavenders in the field. Directions: Clairmont Farms 2480 Roblar Ave, Los Olivos 93441. Take 154 Exit off 101. Go over the pass and pass Cachuma Lake, continue on 154 past the turn to Santa Ynez and Solvang staying on 154. Go left at Roblar Avenue where it intersects 154, about 1.5 miles. Look for the address on the left in about a mile. The Farm is the 3rd driveway from the bottom of the hill. If you come to a Stop sign, turn and it is the third on the right. If the gate is shut, just open and enter, but be sure to close the gate behind you to protect the dogs!! We will be painting at the vibrant stimulating Santa Barbara Harbor. The sign-in sheet will be near the front of the Maritime Museum where we have a Show on July 26-27. Although we will be centered in front of the Museum you may find your muse anywhere along the public space of the Harbor. This will be one of two Paint Outs with the upcoming Maritime Museum Show in mind. Directions: Take 101 or surface streets to Castillo St and then head south towards the ocean until it dead ends at Cabrillo St. Turn right onto Cabrillo St and go around .5 miles to the first stop light turning right onto Harbor Way. Parking is all around but be sure to check any time limits that may apply. This will be the last Paint Out before our July Maritime Museum Show on July 19-20. We will meet at the far South-East end of East beach adjacent to the Clark Estate. There are multiple views of the ocean, Fool’s Harbor, the Bird Refuge and views of the mountains in the background. Directions: Parking will be on Cabrillo Blvd on the ocean side at East Beach at the end of the volleyball courts. The sign-in/ insurance form will be on a silver Honda minivan. There are certain paint-outs that require a reservation as they are being held on private land or lands managed by one of our beneficiaries such as EDC: Coal Oil Point, Sedgwick, Salt Marsh. April 12th we painted at Sedgwick Preserve, managed by UCSB and in order for SCAPE to paint there an application was completed and permission granted. Pre-reservations were not required; however painters were required to sign in. Kate McCurdy was a most gracious hostess and the 11 of us who painted there that day had a great experience as Duke’s Ranch House was opened to us and we were able to explore the ranch. Sedgwick is only open to painters upon completion of the permit and acceptance of the application. The disclaimer for both the owner or administrator of a site (in this case, UCSB) and SCAPE is an agreement to sign a release by the administrator or owner of the Paint Out site to hold it and SCAPE harmless from any liability by reasons of artist(s) painting on the site. In order for SCAPE to continue to be able to paint at Sedgwick and enjoy our association with them, please do not go to Sedgwick Ranch on your own. This is also true of Santa Ines Mission Mills property. They love painters but there is too much liability for them. One of the great perks of being in S.C.A.P.E. is having monthly collegial paint outs with like minded nice people. If you haven’t been to one you will be hooked once you do! It is always fun to paint in new and interesting locations of urban-scapes, landscapes and seascapes. As a member if you have access or live in a spot that offers an enticing view and would accommodate around a dozen painters to set up please contact Filiberto Lomeli or Jerry Martin. We would all much appreciate new ideas and new locations.